UPDATE: After much talk and speculation it's been revealed that Disney will indeed buy 20th Century Fox (as well as some other entertainment and sports assets from Rupert Murdoch’s empire) for a whopping $52.4 billion. "The acquisition of this stellar collection of businesses from 21st Century Fox reflects the increasing consumer demand for a rich diversity of entertainment experiences that are more compelling, accessible and convenient than ever before," said Disney chairman-CEO Bob Iger. Why should you care, you ask? Because the merging of these two entertainment power houses might mean we'll be getting some interesting movie and TV spin-offs in years to come. Deadpool in the MCU? Yes please! Read on for eight things that could happen in the world of entertainment now Disney owns Fox. ORIGINAL: It’s not often we can get excited about one mega-corporation buying another, but 20th Century Fox holding talks over being bought by Disney is different. Very different. 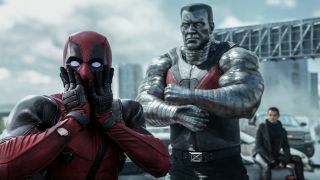 Not only would it cut the red tape tying up some of our favourite characters, it also holds several exciting possibilities for Deadpool, the X-Men, and plenty of other superheroes. Thought Thor: Ragnarok and Guardians of the Galaxy was as funny as the MCU could get? Imagine Deadpool along for the ride. Not only could The Merc with a Mouth interact with more big-name superheroes (I can already see Tony Stark eye-rolling his way through a scene with him), it opens up even sillier avenues for the MCU. Deadpool kills the Marvel Universe, anyone? Fantastic Four has drawn the short straw for some time now. Its latest reboot was a poor effort and – as Spider-Man: Homecoming proved – the MCU is the best place to generate some goodwill for costumed heroes stuck in limbo. Mostly, though, I want a fight between Hulk and The Thing. If you’re one of the half-dozen or so people who can make sense of the current X-Men universe then fair play to you. For the rest of us, we’ll breathe a lot easier when the mutant team gets back to basics: re-introduce the core team, embed them into the MCU (but not too heavily), and definitely take some inspiration from the comics. Logan saw Hugh Jackman hang up the claws (for now) as Wolverine, so what better time to introduce a new Wolvie than with the completely clean slate Fox’s acquisition would present? I’m already getting a bit too excited thinking about a Marvel post-credits scene with a snikt and the reveal of Wolverine’s claws. Read more: Want to listen to Porgs sing the Star Wars theme? Of course you do! Other company collaborations. Hello Universal! Marvel Studios and 20th Century Fox both coming under the Disney umbrella may (hopefully) pave the way for other companies to offer some collaboration. Universal aren’t playing ball with the Hulk rights and Spidey’s deal with Sony means the webhead’s future in the MCU is uncertain at best. Mega-corporations might be a bit dystopian but, hey, if we can get a Planet Hulk movie then I’ll be able to stomach our new Mickey Mouse overlords. The greatest crossover movie EVER! Thanos + Galactus + Fantastic Four + X-Men + Deadpool + The Avengers. Need I say more?